Surprise! The year is one-third over. Estates and trusts can deduct "bundled" fees. Filing dates extended for certain disaster areas. San Francisco broadcasts Financial Insider Weekly. How does one submit withheld money to the IRS? Can I claim my deceased father as a dependent? 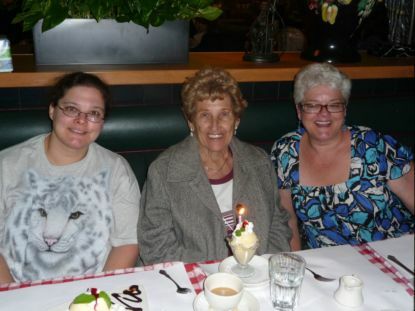 My mother, Eleanor Gray, celebrates her 88th birthday with my daughter, Dawn Siemer, and my wife, Janet. How are things going? Are you working on the goals you set last January, or are they forgotten? As you might guess, tax return preparers live in a parallel universe from February through April. Itâ€™s nice to be back. Let us know how we can be of service in helping you, your business, your family have a successful year. Congratulations graduates! And, good luck with a challenging job market. Monday, May 31 is Memorial Day, the "unofficial" start of summer. Beach parties! Picnics! Barbecues! Have a fun and safe holiday, and remember to honor those who gave their lives for our country. My daughter, Holly Baker, and her husband Dan will be celebrating their eleventh anniversary on May 15. Congratulations Dan and Holly! And thanks for our two grandsons! The IRS has released the final version of Form W-11, Hiring Incentives to Restore Employment (HIRE) Act Employee Affidavit. New employees will submit the form to employers to confirm they qualify as "covered employees" for the HIRE Actâ€™s tax incentives. Qualified Employers will be able to avoid paying their 6.2% share of social security taxes for a covered employeeâ€™s wages from March 19, 2010 through December 31, 2010. In addition, qualified employers may be able to claim a retention credit of the lesser of $1,000 or 6.2% of wages paid during a required 52-week consecutive period. Is not related to the employer. The IRS has extended the filing dates for individual income tax returns and making deposits to IRA and Roth accounts from April 15 to May 11, 2010 for taxpayers residing in or having a business located in a federally-declared disaster area. This applies to certain counties that suffered from storms and flooding in the northeast, including in Massachusetts, Rhode Island, and New Jersey. Certain counties in West Virginia are also eligible. See www.irs.gov for details. Governor Schwartzenegger signed SB 401(Wolf), the Conformity Act of 2010, on April 12, 2010. This legislation conforms many Calfornia tax laws to the federal tax rules, mostly as of January 1, 2010. The most important exception is the exclusion for cancellation of debt for a principal residence, which we detailed in the Extra edition of this newsletter on April 22, 2010. Increasing the age of dependent children potentially subject to Kiddie tax to age 23. Reduction of exclusion from the sale of a principal residence for non-qualified use after 2008, effective for sales after 2009. Surviving spouse can claim the $500,000 exclusion for the sale of a principal residence up to two years after the death of the deceased spouse. Charitable contribution rules conformed for documentation requirements, qualified appraisals, deduction disallowed for clothing not in good condition, recapture of deduction for property donated to a tax-exempt entity not used for a tax-exempt purpose and special rules for fractional interest donations. Basis adjustment to stock of S corporations that made charitable contributions of appreciated property. Payments from federal "Cash for Clunkers" program can be taxable income in California. We are thrilled that the San Francisco public access station, SF Commons, has agreed to broadcast Financial Insider Weekly Fridays at 6:00 p.m. Pacific Time and as streaming video at the same time at www.bavc.org, "public access TV". Thanks to Karen Baker for agreeing to be our local producer in San Francisco. May 5, James Quillinan, Esq. of Hopkins & Carley, "California real estate change of ownership rules in estate and business planning"
May 12, Don Pollard of Advanced Professionals, "What Federal Health Care Reform means for you"
May 19, Don Pollard of Advanced Professionals, "Medical insurance alternatives"
May 25, Don Pollard of Advanced Professionals, "Choosing a medical insurance policy"
June 2, John Hopkins, Esq. of Hopkins & Carley, "Succession planning issues for a family business"
How does one submit money to the IRS for withholding on a 1099? What form is used to report the withholding? First, you have to have an employer tax number to withhold the tax. You apply for one using Form SS-4. Tax deposits can be made with a depository bank using Form 8109, which you can request from the IRS. Alternatively, electronic deposits can be made. The withholding is reported using Form 945, Annual Return of Withheld Federal Income Tax. You can find these forms at www.irs.gov. I have been claiming my father as a dependent for several years. He passed away during January 2009. Can I still claim him on my 2009 income tax return? Probably. You get to claim dependent exemptions for the year of death and the year of birth, even though the individual only was a dependent for part of the year. See IRS Publication 501 at www.irs.gov.